What next for the Gassiev vs Usyk Winner – a move to heavyweight? 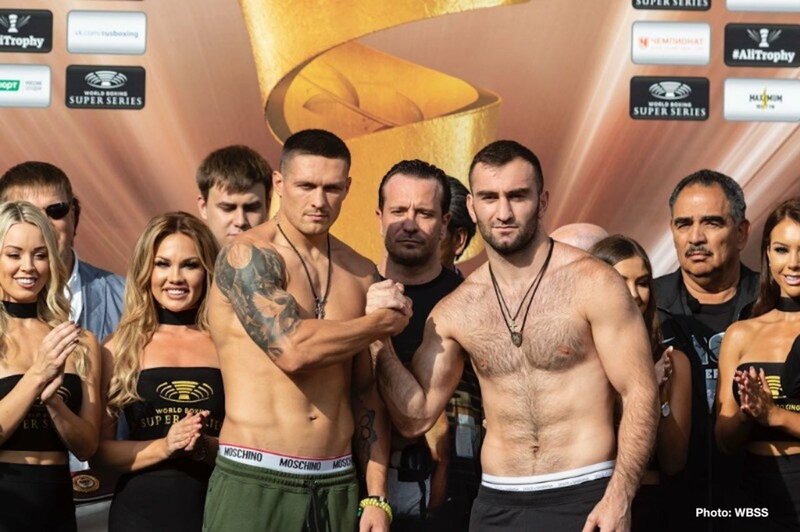 Fans will witness an historic fight tonight in Russia, as unbeaten cruiserweights Oleksandr Usyk and Murat Gassiev will collide for all four world titles at 200 pounds. Russia’s Gassiev, the holder of two cruiserweight world titles, and Ukraine’s Usyk, the holder of two cruiserweight world titles, will put it all on the line – and to make things even bigger, the fight will be the cruiserweight final of The World Boxing Super Series. Simply put, the stakes could not be higher. However, both fighters could go higher after tonight’s big fight – as in higher in weight. Quite recently both men have spoken of the very real possibility of moving up to heavyweight in the near future. Maybe today’s winner will decide that, having achieved all that can be achieved at cruiserweight, a move up to the so-called glamour division of the sport is one that should be taken sooner rather than later. Who knows, maybe both men will make the move north; maybe Usyk and Gassiev will even fight again as heavyweights. Okay, this is getting ahead of things – we have not even seen their big fight yet, and anything could happen in this one – but as both fighters have mentioned the possibility of going up to heavyweight, why not talk about it? As special as both fighters/ boxers/ warriors are, there is a real chance one, or maybe even both of them, could indeed follow the legendary Evander Holyfield and rule as a heavyweight king. But of the two, who has the best shot at making it in the heavyweight division? Both Gassiev and Usyk stand at well over the 6’1″ mark, Gassiev being 6’4” and Usyk standing 6’2,” so on paper at least, both fighters are just about tall enough to have a realistic chance of doing it. In terms of skill, toughness, desire and mental fortitude, no fan can possibly write off either warrior’s chances. For as long as the cruiserweight division has been in existence, fighters operating there have looked upwards, to the glory and the monetary rewards the heavyweight division can bring, and Usyk and Gassiev are no different. Imagine if these two potentially great fighters did actually meet again as heavyweights; who would win then? Can either man, or maybe both men, capture a title at a second weight? First up we have Saturday’s anticipated classic, but after that both superb fighters might just thrill us all anew whilst fighting at a weight significantly above 200 pounds. Heavyweights everywhere should look out if and when these two fantastic fighters do invade the division, that’s for sure. Now, who wins the showdown tonight? Prediction: in an excellent fight that further elevates both men, Gassiev, a modern day Rocky Marciano if ever there was one, pulls out an extremely close 12-round split decision that has fans rocking in their seats. You are here: Home / Boxing News / What next for the Gassiev vs Usyk Winner – a move to heavyweight?